I celebrated my new job at work with a new frame. The criteria were comfort, mudguard clearance and handling. I have previously ridden steel and alloy, and considered titanium and full carbon for this purchase, but eventually settled on the alloy/carbon Kinesis Racelight Gran Fondo. My decision was strongly influenced by reviews in the cycling press, and price: the titanium version was just over my budget. I built up the frame with a variety of used and new parts. This is a frame that is almost invisible in use. I was fairly underwhelmed on my initial rides, but soon realised how little this bike needed input from me. This was particularly noticeable climbing. The ride is fairly firm, but rough roads are accommodated pretty well. The frame feels light and stiff, but not too harsh. Although some say scandium alloys ride more like steel this feels like a comfortable alloy training bike, and the excellent fork and carbon stays probably contribute more to its feel than anything else. Although the finish may not to be everyone’s taste, it is well executed and distinctive. Be warned, the frame should come with seatpost (nice Selcof) and headset (cheap integrated): mine came with neither, although this was rectified fairly swiftly (I used neither in the end). The single eyelets on the rear dropouts make fitting rack and mudguards tricky. Clearance is fairly minimal: with mudguards 23c tires are as fat as I would go. The head tube is really too short for a frame if this kind, and even those with better backs than mine will end up with excessive spacers. As a deluxe training bike this is wonderful. Time will tell whether 23c tires are enough for audax rides on our rubbish British roads. 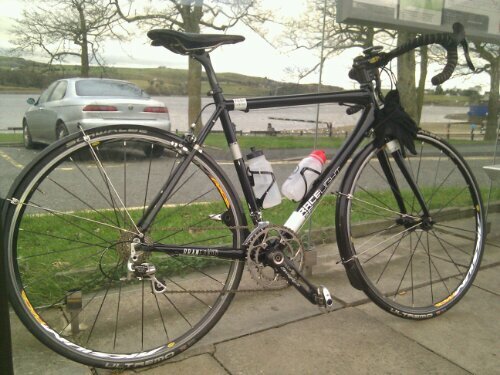 This entry was posted in audax, equipment, randonneur by spandelles. Bookmark the permalink.